Last weekend I got a day that was testosterone free! My husband was away on a job site and took our youngest son with him to work. My oldest son went to Illinois for some college related computer nerd conference. When the boys are away I get to eat what I want, and there’s no one around to complain. I had some arugula and baby Florence fennel in my garden that needed to be used up before I start getting hard killing frosts, so I settled on a salad using the two. The flavor of arugula benefits from citrus, and I had lemon that needed to be used up. I’ve had a container of pasteurized crab meat in my refrigerator just awaiting an opportunity, so the decision to make crab cakes was easy. This recipe is sized to serve 2 people (about 4 cakes), so I ate it for both lunch and dinner. I’ve sampled quite a few crab cakes over the years. 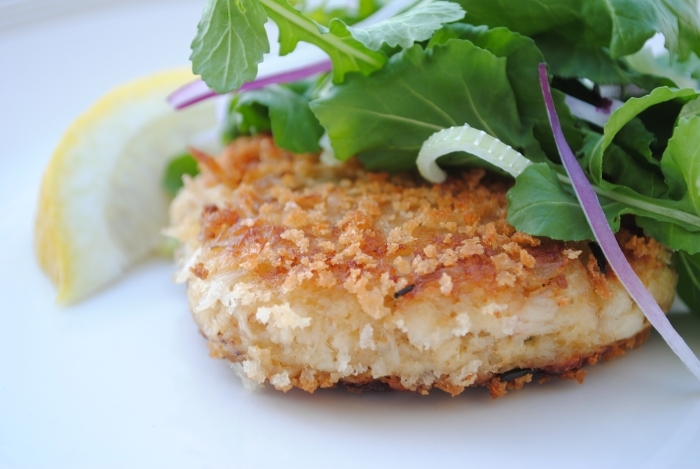 To be honest, a good crab cake is rather hard to come by when you live in the Midwest. In my neck of the woods, the only way to get truly fresh seafood is to buy a live lobster and cook it yourself. Outside of boiling Mr. Lobster myself, “fresh seafood” and “Indiana” is an oxymoron. Most of the seafood available to me is either frozen or shipped in, and is at least a week old and ready to expire. Now that I think of it, this recipe would probably be really good with lobster. But, I digress. 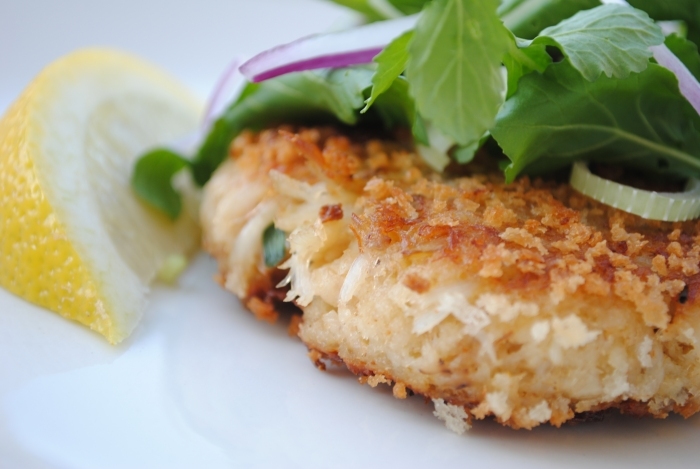 This recipe features the crab, so good quality meat is essential. 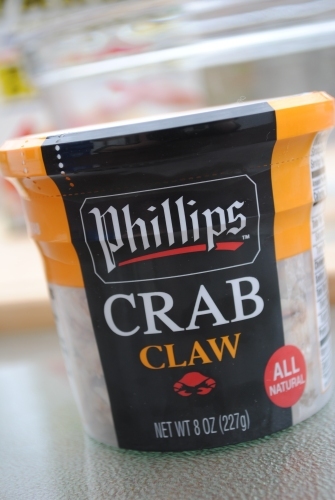 Because I don’t have access to fresh crab, pasteurized crab from the refrigerator section of the seafood department is the next best option. If you have access to fresh crab, and are inclined to steam and pick it, I encourage you to do so. Whatever you do, DON’T use the tinned stuff from the tuna fish aisle! Ick! Also, you want the meat to be a little chunky, and not shredded to bits. The crab meat is the star, and a little chunkiness provides nice texture. This is a very simple recipe. Toss the arugula, fennel, and onion in whatever proportions you find pleasing. Whisk the lemon juice and olive oil together. Season with salt and pepper. Add honey to balance the acidity of the lemon juice. A lot of personal preference comes into play, and making a vinaigrette you like requires tasting. Drizzle vinaigrette over salad just before serving. It’s also perfect with the crab cakes. 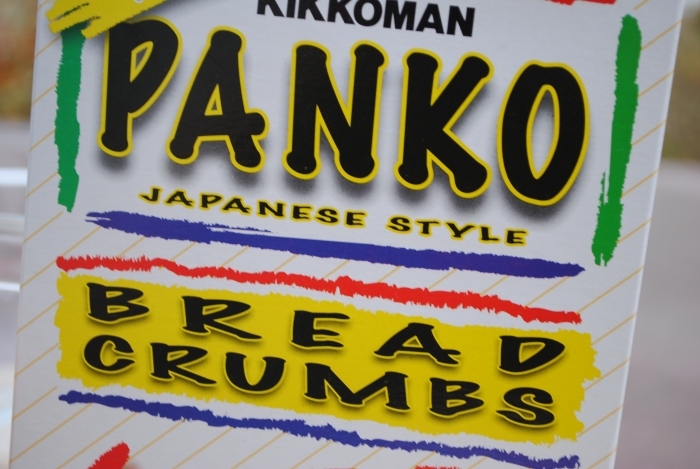 I’m a huge fan of Panko crumbs. Nothing results in a nice light, crispy coating better than using Panko crumbs. In a bowl, whisk the butter, egg, sour cream, herbs, lemon juice, and seasonings together. Gently mix in the crab meat and 3/4 cup bread crumbs. Place mixture in the refrigerator and allow it to sit for 10 or 15 minutes. This will give the bread crumbs time to absorb some of the moisture, and the mixture will bind a little better. The mixture is primarily crab meat, and barley enough binding ingredients to help hold it together. For this reason, you will need to handle the patties gently. Form the mixture into patties and then pat each side in the remaining 1/4 cup of Panko crumbs. Heat skillet over medium-high and cook crab cakes, about 4 to 5 minutes per side, remembering to handle gently so they don’t fall apart.